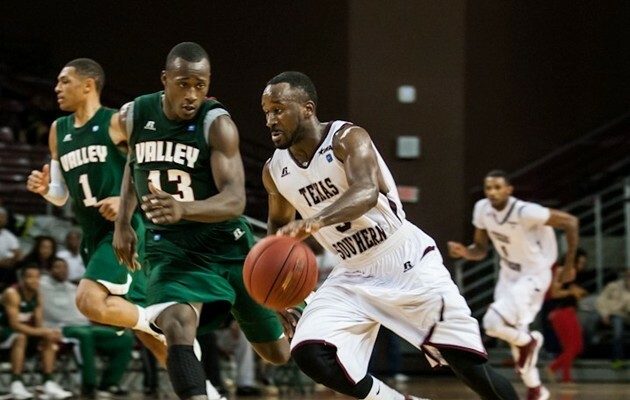 BIRMINGHAM, AL – Texas Southern guard Omar Strong wrote a spectacular close to a stellar career capturing the final SWAC Player of the Week honor of the season. The 5-9 senior left his mark on Tiger lore with a pair of memorable performances, leading TSU to a pair of wins and the regular season SWAC title. Strong scored 52 points, averaging 26 points per contest. He lit up Southern for 34 points on Thursday in the Tigers’ 79-66 win that put TSU into first place. In that game, he hit 9-of-15 field goals, including seven 3-pointers. He also converted down 9-of-10 free throws. In the outright title clincher on Saturday, Strong added 18 more points as TSU rolled to a 73-57 win over Alcorn State. He was 7-of-12 from field with four 3-pointers.For the week, Strong was 16-for-27 from the field, 11-of-21 from 3-point range and 9-for-10 from the free throw line. Strong ended his career at TSU ranked No. 2 in scoring for 2012-13 in the SWAC averaging 17 points per game. He also concluded his career as the All-Time three point field goal leader (222) in Texas Southern basketball history.